Thursday San Diego city leaders announced the city will be joining AARP’s network of age-friendly communities. 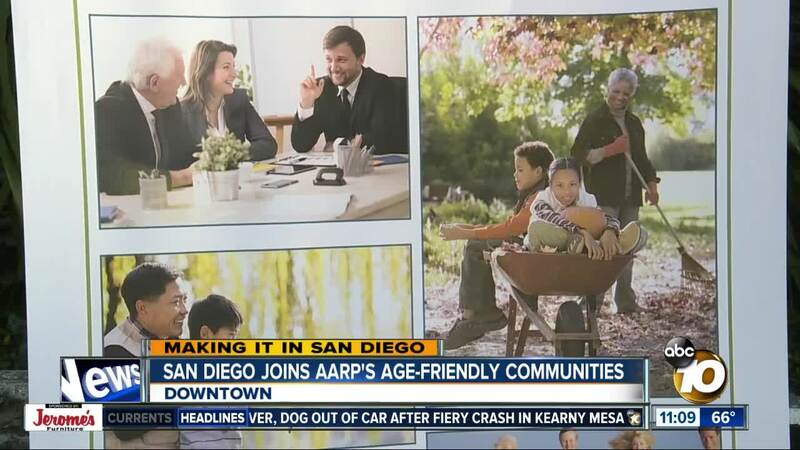 SAN DIEGO (KGTV)- Thursday San Diego city leaders announced the city will be joining AARP’s network of age-friendly communities. This means elected officials have made a commitment to prepare for San Diego’s aging population with policies that will focus on AARP’s “8 Domains of Livability” which include communication, civic participation, housing and transportation. San Diego now joins Chula Vista, La Mesa, and the County of San Diego in becoming an age-friendly community. “San Diego’s membership in the AARP Network of Age-Friendly Communities and our local partnership with The San Diego Foundation are essential to helping residents live easily and comfortably in their homes and communities as they age,” said Ward. Kevin Mayor Faulconer was not present at the news conference, but wrote the following statement. “Here in San Diego we’re focused on building more affordable housing, increasing mobility choices, and creating livable communities to improve the quality of life for all San Diegans, including older adults,” said Faulconer. Across the county the number of people 65 and over is projected to double by the year 2030.